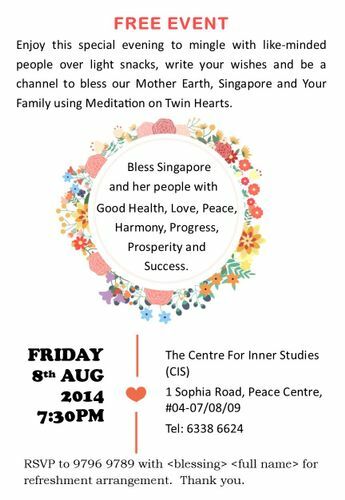 Come and celebrate Singapore National Day by blessing our country and people using Meditation on Twin Hearts. Be a world server to bless our Mother Earth, our country and our family and friends with love, peace, harmony, prosperity and success. Mingle with like-minded people over light refreshment and write your wishes for Singapore and family to be blessed by you!